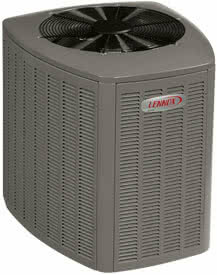 Efficiency rating of up to 17 SEER can save you hundreds of dollars each year in energy bills, compared to older units. Precision-balanced direct-drive fan delivers quieter operation and longer equipment life. Efficiency rating of up to 17 SEER can help save you hundreds of dollars per year in energy bills, compared to older units. ENERGY STAR® Qualified means the air conditioner meets or exceeds U.S. federal guidelines for energy efficiency. Sound levels as low as 71 dB—much quieter than a standard air conditioner. Precision-balanced direct-drive fan—delivers ultra-quiet operation with a patent-pending fan design. PermaGuard™ Cabinet is constructed of heavy-gauge, galvanized steel and has louver coil guard, baked-on powder finish and durable zinc-coated steel base to provide long-lasting protection against rust and corrosion.